We are pleased to announce that we will be exhibiting at Manufacturing & Engineering 2018 in a month’s time. The show spans 2 days – 4th & 5th July – and is located at the Metro Radio Arena, Newcastle. Manufacturing & Engineering is the only industry event of its type in the North of England. The show provides the ideal environment for design engineers, manufacturers and production professionals to benefit from direct access to the latest products, services and innovations available to the sector. With 15 conference speakers, a wide-range of free-to-attend workshops and a great mix of exhibitors showcasing their products and services, Manufacturing & Engineering is the must-attend event for industry professionals in the Northern Powerhouse. 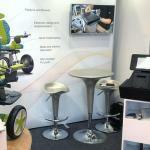 You can find us on Stand C18 – where we will be showcasing the finest prototyping, product manufacturing and tooling. Some examples include medical equipment casings and the NHS collaborative project – Chair 4 Life. Click here to sign up for free delegate tickets.